Bonjour de Paris. Europe, my dream travel destination. Postgraduate school classmate Miss Ko visited her undergraduate classmate, who was doing her exchange study, in the Netherlands in winter vacation. 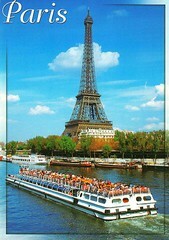 She sent this iconic postcard of Paris to me and promised me to show her pictures to me after her tour. But I have not seen anyone yet.